Late-night talk shows give way to the overnight news, stock markets around the world stretch to life and the sun begins to consider rising. While the rest of the world sleeps, Eric Luhmann scours the World Wide Web, virtually picking grapes. It’s 3:30 in the morning. When you’re making European wine in Carteret County, you do what you have to do. Luhmann, the indefatigable, straight-talking owner of Somerset Cellars in Morehead City, is among a growing group of resourceful winemakers across the nation who have used creative ways to get around one major detail: There’s not a vineyard, vine or even a grape in sight. Luhmann, a 40-year-old Long Island, N.Y., native with the accent and the attitude to prove it, has made wine with family, friends and extended family since long before he was old enough to drink it. Using what he’s been taught since he was 10 years old, Luhmann makes his product in the old-world style—a long, painstaking process in which the wine is born at its own pace and as naturally as possible. Sales indicate that Luhmann is making good wine from good grapes. Walking through a back room in his nondescript 1,000-square-foot building behind a TV repair shop on Arendell Street, Luhmann points to a pair of empty wooden pallets. A week ago, they were stacked floor to ceiling with cases of wine. 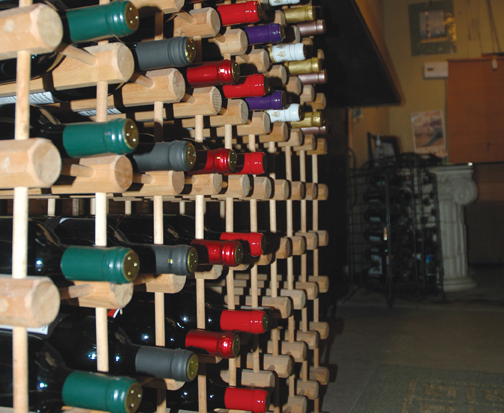 The shelves in the retail area of his winery—known in the business as a “microwinery”—sit perilously close to empty. Demand long ago surpassed supply, an indication that here, untold miles from the nearest living grapevine, the production of fine wine is possible. “We just didn’t think it was going to take off like it did,” Luhmann says. “People say that’s a great place to be. I’m not comfortable with it because I’m not giving my customers what they want when they want it.” Luhmann orders grapes—already crushed, to eliminate steps in the process, and often concentrated—from vineyards around the world. His day begins early, when he rises to work his sources around the world in search of the finest “juice,” as it’s known in the industry. The product arrives from Italy, Germany, Sicily, Chile, Australia, Argentina, South Africa, South America, California, France and Spain, a list Luhmann rattles off in seconds like George Carlin rattles off forbidden words. Because of the lengthy winemaking process Luhmann uses, the juice might not see the inside of a bottle for two years. Luhmann, who’s not a fan of the super-sweet scuppernong/muscadine varieties grown in North Carolina, gets none of his juice from within the state. That’s why you won’t find Somerset on any promotional lists of North Carolina vineyards, a fact that doesn’t sit well with its owners. Luhmann, unlike most winemakers, doesn’t filter his wine because of the chemicals the process adds to the finished product. He says using filter plates is “unnatural” and that it costs the wine color, body and flavor. It’s hard to say exactly how many people are running businesses like Luhmann’s. While the wine industry in North Carolina as a whole has enjoyed an unprecedented explosion over the past few years—doubling from 35 wineries in 2004 to 70 today, which doesn’t include the more than 400 commercial grape growers—no one can put a finger on the growth of microwineries. “We’ve had a handful of those over the past few years,” is as specific as Margo Metzger, executive director of the North Carolina Wine & Grape Council, can get. Nationwide, the figures are just as elusive. Jenny Mattingly, the director of communications for WineAmerica—the National Association of American Wineries—says learning more about microwineries is on her list of things to do, adding that the trend is growing. “It’s not something that’s been on people’s radar screens, I think, as much as it probably will be,” she says. Point your browser to the state wine and grape council’s Web site (www.ncwine.org) and you’ll find an interactive map highlighting wineries from Murphy in the extreme west to Knott’s Island in the northeast corner of the Old North State. You’ll find tips for wine-themed travel in the state, as well as data detailing the industry’s recent growth. But because Luhmann doesn’t use grapes grown in North Carolina, you won’t find Somerset or any other microwineries that use imported grapes exclusively. The Wine & Grape Council requires that in-state wineries use a percentage of North Carolina-grown grapes to be considered makers of true North Carolina wine. “There’s absolutely nothing wrong with that kind of operation,” says Metzger, who has headed the council for four years. “But for us promoting viticulture in North Carolina and promoting our wine and agritourism, it’s important to this council that each business at least make an effort to have part of that agricultural connection to North Carolina. “It’s a perfectly good business model. There’s nothing wrong with that. 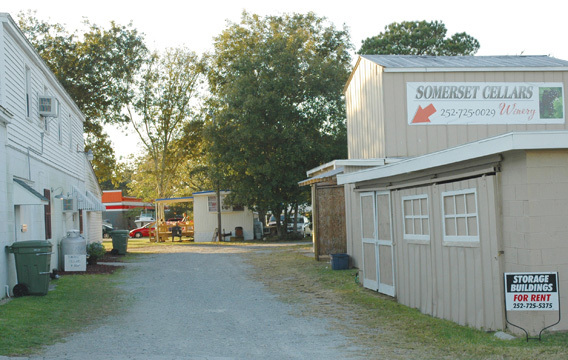 It’s just that it’s not really North Carolina wine.” Luhmann, who says he has asked the council and his legislators to include his company in the state’s promotional materials, argues that Somerset promotes tourism within the state and, therefore, should be included. He says about 1 percent of his customers have asked him tomake an indigenous scuppernong/muscadine varietal but that the demand isn’t high enough to justify ordering the juice. Besides, he just isn’t fond of it. Luhmann, if it isn’t yet obvious, is a confident, straightforward, opinionated businessman to whom, he says by way of a credo, failure is not an option. He has owned restaurants, a tire company, an automotive repair company and, now, Carteret County’s first and only bonded winery. After growing up in New York, Luhmann followed his parents to the Crystal Coast when they retired here 20 years ago, only to return north briefly because he found the pace of Eastern North Carolina “too damn slow.” Before long, though, North Carolina called to Luhmann again. He missed the laid-back South, so he returned and opened his automotive repair shop in Cape Carteret. If his name seems familiar, it’s likely because in 2000, Luhmann was injured in a freak accident involving a fire truck in Carteret County. He spent five years in a wheelchair as a result, and after years of arduous rehabilitation he is able to walk with a cumbersome knee brace.Luhmann won a highly publicized lawsuit after the accident, but even though he still deals with daily pain, he has clearly moved on. “I don’t wantto be known for that,” he says, which is all he’ll say on the record regarding the matter. In the time he spent immobilized, Luhmann began to consider turning his winemaking hobby into a full-time pursuit. 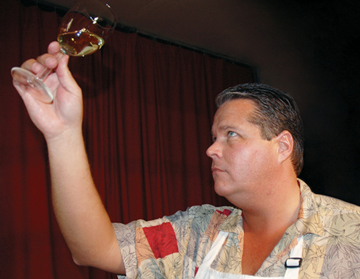 Having learned the craft from relatives of German, Italian and Irish descent and friends in the restaurant business, he had been making wine and giving it away to friends ever since he could remember. He made wine in his Cape Carteret home, but the smell became overwhelming. He bought a bigger house, which only left him room to make more wine. To open a bonded winery—the federal government requires bonding to make more than 100 gallons per year per individual—Luhmann had to submit to background checks from the FBI, the Treasury Department and Homeland Security, which normally takes a year. Susan Luhmann, a California native who did not want to be interviewed for this story, is a former FBI employee, which sped up the process. Eric Luhmann is passionate—obsessive, even—about the cleanliness of his product. All equipment, from the stainless steel vessels that store his wine to the bottles his customers take home, is sanitized six times before the wine touches it. He uses only bottled water throughout the process. The result is evident in the empty shelves that surround his tasting room despite an almost hidden location off the Crystal Coast’s busiest thoroughfare. Next, Luhmann plans to let others in on the joys of winemaking. In the near future he hopes to provide customers with all the tools they need, including his imported juice, to try their hand at becoming small-scale vintners. Luhmann, who has a soft spot for Caribbean vacations, also hopes to open a similar operation in Aruba, bringing in grapes from nearby Venezuela. “It would just be a crying shame if I had to fly out there twice a month and check on things,” he says with a laugh that comes easily. The North Carolina wine industry is in fine shape, with or without Luhmann as an officially recognized part of it. According to a report released by the Wine & Grape Council in January 2007, the wine and grape industries in North Carolina account for 5,700 jobs with a payroll of more than $159 million. In 1975, the state had one winery. That number grew, gradually, to 12 in 1995 and then took off. By 2005 there were 54 wineries in North Carolina, with a growth rate of a new one per month over the past four years. The state now ranks 10th in the nation in wine production and appears to be moving up. Luhmann hopes his children, who range in age from 7 to 19, will develop an interest in the business and take it over someday, but he insists they will not be forced into it. Even if the winery dies with him, Luhmann takes great pride in the fact that, in Carteret County at least, it was the first. Like an artist leaving the world with masterful works or a musician whose songs will be sung decades after he’s gone, Luhmann believes he’s leaving a legacy to be enjoyed indefinitely. It makes those impossibly early mornings conducting global searches for better grapes well worth it.